Now there’s nothing wrong with opening a bottle and pouring your wine into a paper cup, if that’s the only drinkware available. Which reminds me, it’s a kick to be in a grocery store and the server gives you a thimblefull in a little plastic cup to sample. You can’t swirl to smell it or check out its legs (we’re speaking of the wine here, not the server), and the plastic in no way helps what are already issues. But, if you’re in the confines of your home, the experience should be the ultimate. You don’t have to use crystal, but for Pete’s sake, use a wine glass. After opening the bottle, go ahead and take a sip. In the case of red wines, check out those acids and tannins, because they’re going to change, and it’s always fun to compare back to the first sip after you’ve decanted the bottle. 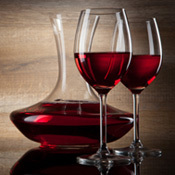 Not only does a decanter (buy one if you don’t already have one) look classy, but it gives the wine a chance to breathe. What might have seemed somewhat harsh right out of the bottle will begin to mellow and smooth out. Oxygen does that to wine. Since we’re on the subject of red wine, let’s talk polyphenols—antioxidants in wine—that may help the lining of blood vessels in the heart. Based on research, one particular polyphenol called resveratrol “could be linked to reduced risk of inflammation and clotting.” Just goes to show you that wine in moderation could be a healthy thing. Temperature is always important. Red wine at room temperature, right? But what is room temperature? It’s not 72 degrees F. The ideal temperature is 55 F. What some people call Normandy Castle, cool and damp. 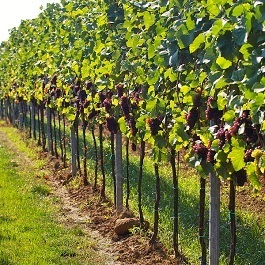 Most home cellars with the right equipment keep reds between 55 and 69 F. If you just bought a bottle for dinner, it will serve you and the wine better to put it in the fridge for 30 to 45 minutes. Coincidentally, 55 to 65 F is the perfect temperature to serve Rutting Ridge Cabernet Sauvignon. Cheers!